I love that Halloween is on a Saturday this year! It means we can all stay up late on Saturday night and hopefully sleep in on Sunday morning. We’ll see how that plan goes after everyone gets all sugared up! It already feels like the holiday started this weekend and we get to ride the fun and anticipation all week long! We are really late this year when it comes to costumes and getting ready for all the dressing up we’ve got in store for next weekend, so I will need every minute of this week to pull it together. Along with helping to decorate Kenya’s classroom, make Halloween food and crafts in Chloe’s class and cooking for the yearly Halloween trick or treating party we attend it’s going to be a very busy week. I’m going to be making Freaky Franks, Mummy Dogs, Pizza Mummies, Tangerine Pumpkins and Bananas Ghosts for the different get togethers and these Deviled Egg Spiders. They’re a spooky choice for a party or a simple recipe for school lunch. 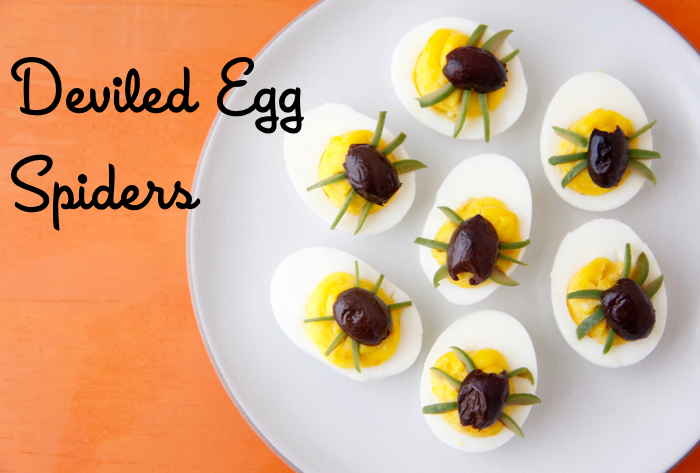 If you’ve got leftover hard boiled eggs or want a high protein snack make these Deviled Egg Spiders with Davidson's Safest Choice Eggs. 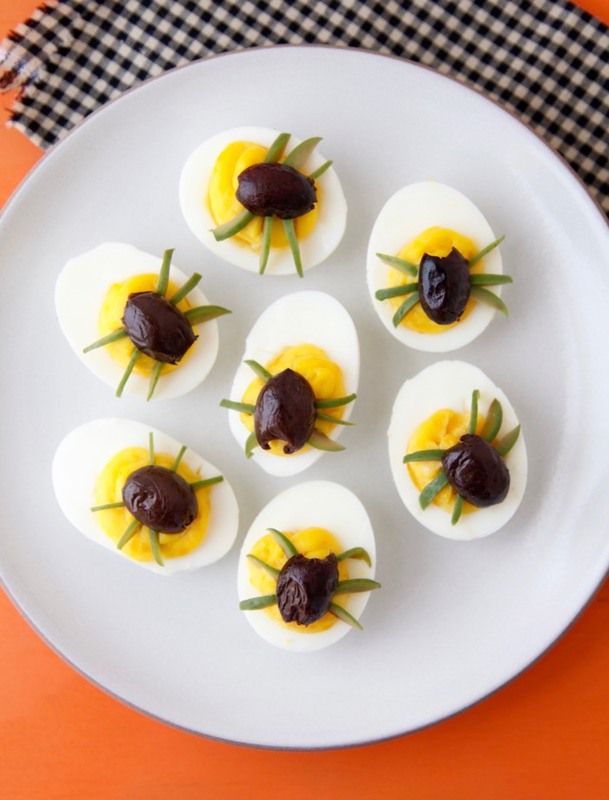 They’re simple to whip up and the olive “spiders” give the deviled eggs an unexpected briny kick that will have your little goblins asking for more! Swing Eats_ Trick or Treat, Spaghetti or Squash? Both! This post is sponsored by Davidson's Safest Choice Eggs. All opinions are my own. 1. Slice the eggs in half lengthwise. Remove the yolks and place in a mixing bowl. Add the mustard, mayonnaise, and salt to the yolks and mash together with a fork. 3. Slice 12 olives in half lengthwise. Place one half, cut side down, on top of each deviled egg. 4. Slice the remaining olives in half again lengthwise and then into 4 slices to make the legs. 5. Place 3-4 legs on each side of the olive halves on top of the deviled eggs. Eggs are one of my favorite foods. They sometimes get a bad rap but they are a delicious healthy food. 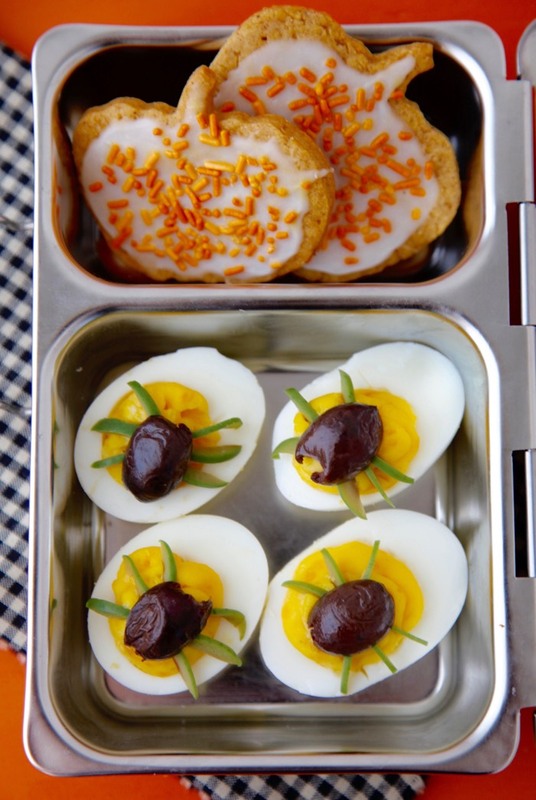 Hard boiled eggs are the best and they make a great sandwich.